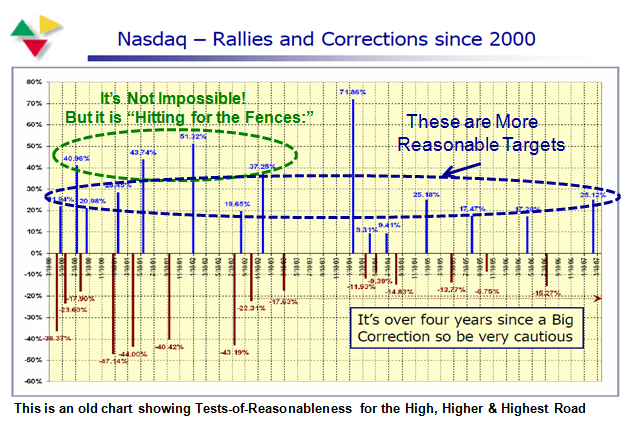 Ian Woodward's Investing Blog » This Bear Market Rally Has Legs! 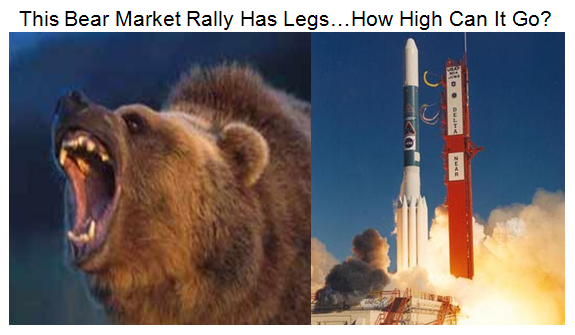 This Bear Market Rally Has Legs! The airwaves are full of the fact that this has been the best four week stretch since 1933. The big question is having delivered over 25% how far can it go? 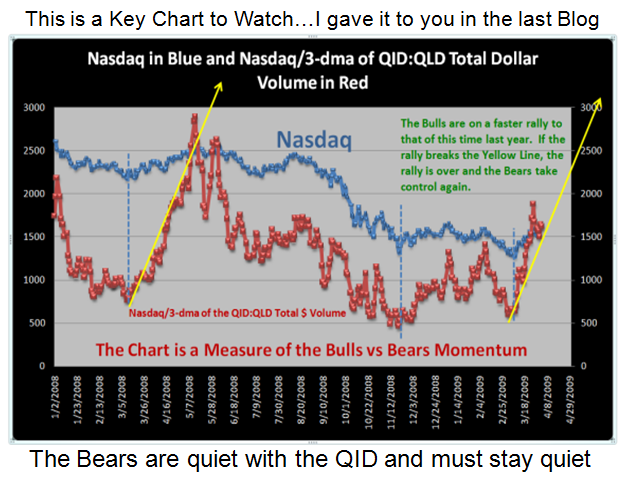 Since I have been a big QID and QLD Watcher, the factors I have developed to understand the thrust of the Bears and Bulls suggest that the Bears are on their heels for now and have gone a trifle quiet, while the Bulls are flexing their muscles and keeping the ratio of the QID/QLD Total Dollar Volume down to numbers <1.0 and as low as 0.8…not seen before. 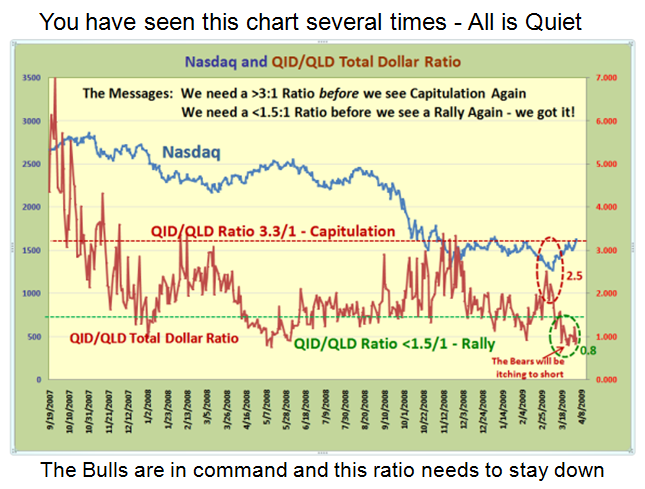 So the contrarian view is that the Bears will soon be itching to short. 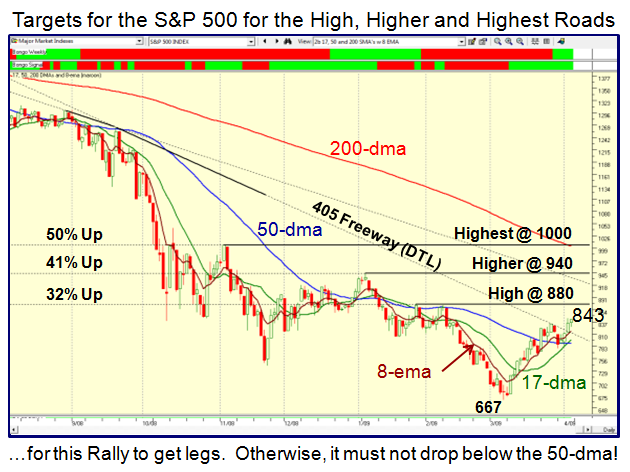 as it did in May last year, then the rally will be over for now. sure we can set yardsticks for what would seem to be reasonable based on past statistics. the tide doesn’t turn sharply, so here are the High, Higher and Highest Roads for the S&P 500 and the Nasdaq, respectively. 3. 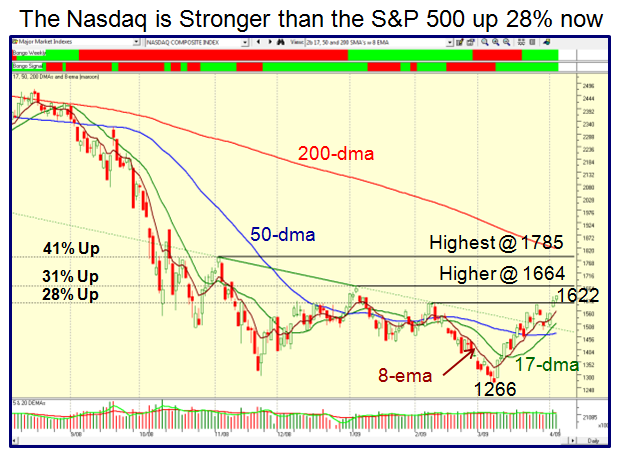 The final gasp at the Base Low of 667 and 1266, as shown on the charts. Heaven help us! the old adage is “Go away in May” as all will be headed for the Hamptons! allows for a little break below the 50-dma. 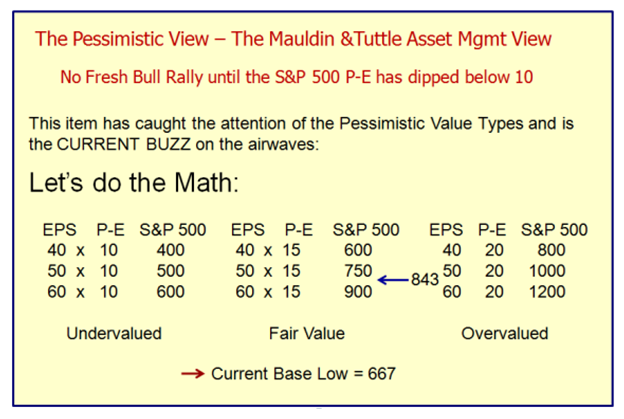 This entry was posted on Saturday, April 4th, 2009 at 5:40 pm	and is filed under HGS Principles, Market Analysis. You can follow any responses to this entry through the RSS 2.0 feed. Both comments and pings are currently closed.